We have done a lot of seasonal/holiday dot painting (you can find links to those at the end), but I wanted something that we could pull out and do whenever. These Shapes Dot Painting printables were the perfect solution. They offer a fun, mess free, low prep, hands on learning activity for kids. 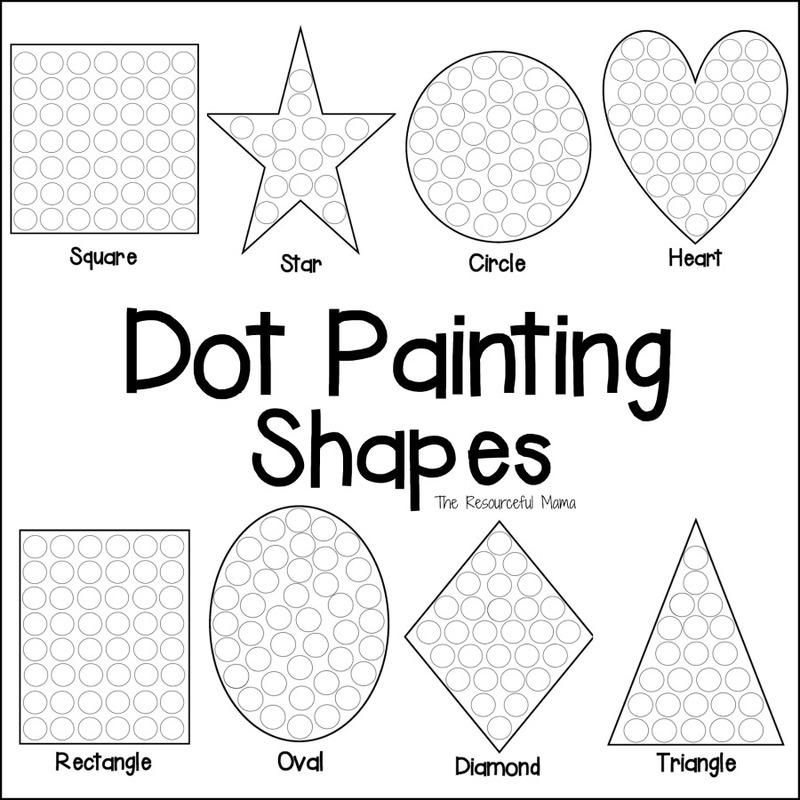 Dot Painting offers several benefits, but these Shapes Dot Painting printables offer an added bonus. These worksheets offer kids a fun hands on way to learn their shapes as they fill in the dots for each shape. You could also extend the learning to math and count the dots each shape holds with your child or student. This Shapes Dot Painting set includes eight black and white worksheets with the name of each shape on the worksheet. The shapes included are: square, star, circle, heart, rectangle, oval, diamond, triangle. Download and print these dot painting worksheets on regular 8 1/2 x 11″ paper. We use Do A Dot Art! Markers for dot painting. You could also use Bingo Markers or Pom-Poms. Use a clothespin and squeeze a pom pom for a DIY pom pom dot maker. Round stickers work great for filling in the dots as well. Round stickers make these worksheets more portable for on the go when you need a quiet activity to keep kids busy like doctor appointments and dining out. These dot painting worksheets offer several benefits to kids and students. Besides being mess free, dot painting also helps kids develop hand-eye coordination as they direct their marker to the spot on their paper. Kids strengthen fine motor skills as they hold the dot markers and move their hands to apply the marker to the paper. Do A Dot Art Markers, are especially great for little ones. They are chunky, making it easier for their little hands to easily grab and manipulate. There doesn’t seem to be a link to download the shapes? Or am I just missing it? Hi Shalyn, it is right above Holiday/Seasonal Dot Painting towards the end. It says Download: Dot Painting Shapes.